Find out about the most recent news at Shriners Hospitals for Children-Canada, new services, exceptional kids and the construction project. Last year, 17-year-old Jeffrey, a Shriners Hospitals for Children® – Canada patient, proved that obstacles can be overcome finishing not one but four Spartan Races… with a prosthetic on his right foot and no right hand. “Every race is exhausting, but it is really a question of putting yourself in the right mental space… if I can do it, anyone can,” Jeffrey insists. This year, he will try to go for the “Trifecta” – running a 5 km, a 13 km and a 20 km Spartan Race! Jeffrey says he’ll run races until his team raises $10,000 for our hospital! He has even recruited his parents, grandfather, brothers and friends to run and fundraise with him! Jeffrey won’t be running alone. Two more Canada Shriners Hospital patients have been inspired to prove that physical disabilities don’t necessarily mean limitations. Philippe, who’s 18 and has cerebral palsy, ADHD and an intellectual disability, will be challenging himself to a Spartan Race. 14 year old Aurélie will be running a Spartan Race too. She was born with one leg shorter than the other and had to undergo a painful leg lengthening less than two years ago. All patients at Canada Shriners Hospital face obstacles: we treat children with orthopaedic and neuromuscular problems such as scoliosis, brittle bone disease, club feet, hip dysplasia, leg length discrepancies and cerebral palsy. Our mission is to treat and rehabilitate our patients. Our aim is to convey to them that so much is possible when we put our mind to it. That’s why, for the second year in a row, Canada Shriners Hospital is a Spartan Race charity partner. Anyone willing to raise a minimum of $200 for Shriners Hospitals for Children – Canada, can get a free entry into the Spartan Race of their choice (adult or junior race). We’re also looking for volunteers to represent us on Spartan Race days (see below). Why this partnership? Spartan Races challenge participants to make it to the finish line, not necessarily to win. The idea is to help and encourage others during the race, so that everyone can get that coveted “Finisher” t-shirt and medal. Spartan Races have many of the same goals we at Canada Shriners Hospital have: showing compassion, helping others and trying our best to overcome obstacles both physical and psychological. We are using Spartan Races as an example of a challenge kids and adults alike can take on to prove to themselves they can do great things. To sign-up with our Canada Shriners Hospital Spartan Race team, to volunteer or to become a spokespatient email : moncommunications@shrinenet.org. Where and when are the Spartan Races? Canada Shriners Hospital is a charity partner in: Montreal, Quebec City, Ottawa, Edmonton, Toronto, Calgary and Red Deer. “We have healthy children who have not required the care at Canada Shriners Hospital, but we know several people who have benefitted from this outstanding hospital,” adds co-chair Carmie Saputo. “Sports plays a big role in our lives. The fact that Shriners Hospitals for Children can help some kids – who at first never had hope to walk – play sports or run around with their friends, is amazing. This hospital’s expertise changes the lives of thousands of children every year,” she adds. Our inaugural ball would not be possible without the generous support of all our donors and sponsors. We would like to express a special thank you to our diamond sponsors: Letko Brosseau, Placements Borsa | Famille Elina et Giuseppe Borsellino, Roasters Foundation, Saputo Inc., The Rossy Family Foundation, Carmie & Joey Saputo Foundation, Fondation Mirella et Lino Saputo and J.E. Hanger Inc. de Montréal, as well as to our gold sponsors: Broccolini Construction, Giuseppe Monticciolo Senior and Family, MEGA | MATTEL, Placements Benirosa and Power Corporation. We would like to thank all of the participants and donors that have contributed to this event. Taking place on Saturday, October 3rd at Uniprix Stadium (two days before the new hospital greets its first patient), the theme of the ball will be reminiscent of the founding of Canada Shriners Hospital in 1925: Hollywood Glam. The evening’s M.C., Michel Lacroix, is known to most as the voice of the Montreal Canadiens. Mr. Lacroix has had a distinguished broadcasting career over the past 35 years on both radio and TV, which has also included as announcer, commentator and reporter at Olympic Games, various World Championships, tennis games at Jarry Park and several other major events in Montreal, as well as on RDS. Jimmy Vali and his band from New York City will be going back in time to the ‘20s in their repertoire to keep the evening moving on the dance floor. Vali Entertainment has earned a worldwide reputation over 50 years for providing superior quality music and entertainment for the likes of parties and weddings hosted by actors Glenn Close and Seth Rogan, author Tom Clancy and former First Daughter Chelsea Clinton, as well as highly regarded institutions such as NYC’s Metropolitan Museum of Art. The evening’s DJ will be Montreal’s own Vito V: DJ, producer and radio host. Vito V is one of the most sought-after talents in the nation and has shared the stage with some of the world’s biggest acts, having even earned a residency with David Guetta at the famous Wet Republic in Las Vegas. He has released four albums and has found big success with singles “Billionaire” and “Live Tonight”. Vito V began his radio career with a syndicated show on Canada’s NRJ radio stations and is now an announcer on Montreal’s most prestigious hit music station, Virgin Radio 96, four nights a week. Established in Montreal in 1925, Shriners Hospitals for Children – Canada is the only Canadian establishment within the network of 22 Shriners Hospitals, the others located in the U.S. and Mexico. The bilingual, short-term, acute care hospital provides ultra-specialized orthopaedic care to children from coast to coast, the U.S. and around the world. The mission of the hospital is to promote health and provide treatment and rehabilitation to infants, children and young adults with orthopaedic and neuromuscular problems such as scoliosis, brittle bone disease, club feet, hip dysplasia, leg length discrepancies and cerebral palsy. The hospital is committed to excellence and innovation in clinical practice, research and education and to ensusuring patients and their families are treated in a caring, family-friendly environment. The hospital is affiliated with McGill University and provides clinical experience and teaching for residents and allied professionals. The hospital is present in communities across Canada thanks to telemedicine, outreach clinics and two satellite clinics located in Winnipeg and Halifax. Shriners Hospitals for Children – Canada has been helping kids reach their full potential for 90 years and counting. To donate to the Inaugural Ball, for more information or to purchase tickets, please call Emmanuelle Rondeau at 514-282-6990. Dedication and Ribbon Cutting Ceremony Officially Opens New Shriners Hospitals for Children - Canada! 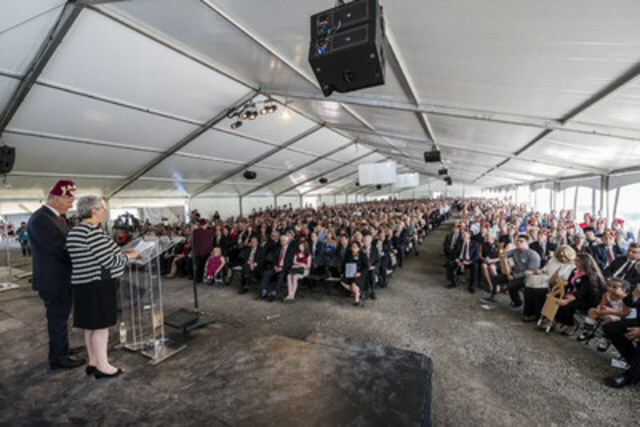 MONTREAL, Aug. 20, 2015 /CNW Telbec/ - Over 2000 people attended the Shriners Hospitals for Children®- Canada dedication ceremony this afternoon and watched as Quebec Premier Philippe Couillard and Shriners Hospitals for Children® leadership cut a huge red ribbon officially opening the Montreal-based facility. Also present were Quebec Health and Social Services Minister Mr. Gaétan Barrette, M.D., Mr. Denis Coderre, Mayor of Montreal, , Mme. Céline Doray, Administrator of the Shriners Hospitals for Children®-Canada, Mr. Normand Rinfret, Director General and CEO of the McGill University Health Centre (MUHC), Mr. Gino Beretta, Chairman of the Board of Governors, Shriners Hospitals for Children - Canada, Mr. Dale Stauss, Chairman of the Board of Trustees, Shriners Hospitals for Children, Mr. Jerry Gantt, Imperial Potentate Shriners International and many other dignitaries. Patient representatives helped make the grand opening and hospital tours poignant. The new hospital is modern, bright and spacious. The 207 000 sq. ft. facility allows the Shriners Hospitals for Children – Canada to provide infants, children and young adults with state-of-the-art care and rehabilitation in a warm and friendly environment. It features a realm of new services and technologies including 22 single-patient rooms, four surgical suites including one designed specifically for back surgery and a 200-seat education centre to enhance the teaching mandate as well as the care offered to current and future patients. Shriners Hospitals for Children – Canada provides full investigative, therapeutic and rehabilitation services on an inpatient and outpatient basis. The hospital treats patients in need of complex pediatric orthopaedic care for disorders such as osteogenesis imperfecta (brittle bone disease), scoliosis and spinal deformities. It also cares for patients with neuromuscular conditions such as cerebral palsy. In addition, the hospital's highly skilled health care providers help children with limb length discrepancies and those who need reconstructive hand or plastic surgery. Other areas of specialization include the treatment of metabolic and heritable bone, rheumatology and urology diseases. The project was completed on time and on budget and was overseen by André Ibghy Architects Inc. and a construction committee composed of representatives of Shriners International and the Montreal hospital. The conventionally financed facility was built by SNC-Lavalin. From the reception area to the recovery room, the hospital sets new standards in pediatric orthopaedic care, surgery, research and teaching. The hospital includes numerous new features such as an ambulatory care infusion room in which children with osteogenesis imperfecta (brittle bone disease) can receive drugs intravenously and an operating room equipped with an O-arm surgical Imaging System for spine surgery. This system gives surgeons unprecedented two- and three-dimensional images of the patient's anatomy making the placement of surgical rods and screws more precise. The new hospital was designed with a deep understanding that it will be a home away from home for several of the children and families served. Many of them will have travelled from across Canada, the northeastern U.S. and from around the world for treatment. The overarching objective was therefore to make the facility welcoming and friendly. To this end, each floor features the colours and attractions of a different region of Canada from the Atlantic to the Pacific to the Artic. Whimsical touches are found throughout. In the reception area, iconic maple leafs float down from the ceiling. The inpatient rooms located on the fourth floor have a beach theme with huge murals of sand castles and lights shaped like portholes. Also on the fourth floor, the Child Life Department has an under-the-sea theme with a huge sea life mural and lights that look like bubbles lazyly floating to the ceiling. The Child Life Department also features a classroom with a huge picture window and an impressive view of the Montreal skyline and Mount Royal. There is even an indoor zen garden bathed in light where parents can enjoy a few minutes of quiet respite. The building's interior design is bright and airy, with a generous amount of large windows and several skylights inviting natural light deep into the heart of the structure. Altogether, this creates a unique healing and caring environment. 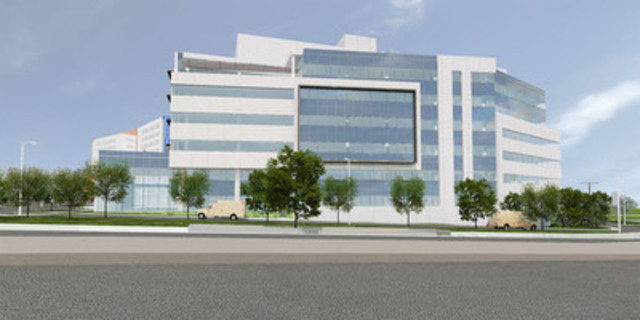 The six-floor building located on Décarie Boulevard punctuates the west end of the MUHC Glen site. 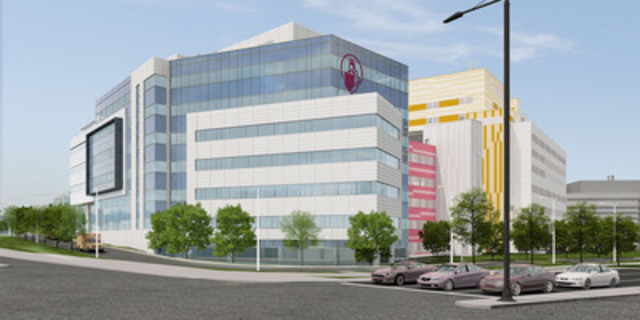 The Canada Shriners Hospital is linked to the Montreal Children's Hospital on two floors, which will facilitate greater collaboration, operational efficiencies and ease of access for patients and families. The hospital is nearly three times bigger than the Cedar Avenue building and as a consequence, the new Shriners Hospitals for Children – Canada is in the process of recruiting and hiring 40 full-time nurses, nurses aids, cleaners and other employees. Thanks to the incredible support of the community, the Exceptional Care for Exceptional Kids capital campaigned has raised $123-million, with the goal of reaching $130-millon ($127-million for the hospital and $3-million for the Francis Glorieux Chair in Pediatric Musculoskeletal Research) by May 2016. A huge thank you to the thousands of individuals and corporations who have made this hospital possible. Your generosity will allow our dedicated health care professionals to care to help our patients reach their full potential. Established in Montreal in 1925, Shriners Hospitals for Children – Canada is the only Canadian establishment within the network of 22 Shriners Hospitals, the others located in the U.S. and Mexico. The bilingual, short-term, acute care hospital provides ultra-specialized orthopaedic care to children from coast to coast, the U.S. and around the world. The mission of the hospital is to promote health and provide treatment and rehabilitation to infants, children and young adults with orthopaedic and neuromuscular problems such as scoliosis, brittle bone disease, club feet, hip dysplasia, leg length discrepancies and cerebral palsy. The hospital is committed to excellence and innovation in clinical practice, research and education and to ensuring patients and their families are treated in a caring, family-friendly environment. The hospital is affiliated with McGill University and provides clinical experience and teaching for residents and allied professionals. The hospital is present in communities across Canada thanks to telemedicine, outreach clinics and two satellite clinics located in Winnipeg and Halifax. Shriners Hospitals for Children – Canada has been helping kids reach their full potential for 90 years and counting. Image with caption: From left to right: Kathleen Weil, Quebec Minister of Immigration, Diversity and Inclusiveness, Robert Poëti, Quebec Minister of Transport and Minister Responsible for Montreal, Quebec Premier Philippe Couillard Shriners patients Marie-Pierre Paquet and Carter Brown, Mr. Jerry Gantt, Imperial Potentate, Shriners International, Mr. Dale Stauss, Chairman of the Board of Trustees, Shriners Hospitals for Children, Mr. Gaétan Barrette, Quebec Health and Social Services Minister, Mr. Denis Coderre, Mayor of Montreal, Mme. Céline Doray, Administrator of the Shriners Hospitals for Children – Canada. Image with caption: Dr. Jean Ouellet, Deputy Chief of Staff and Orthopaedic Surgeon, Shriners Hospitals for Children - Canada, gives a tour of the new hospital's state-of-the-art operating rooms. Image with caption: From left to right: Mr. Gino Beretta, Chairman of the Board of Governors, Shriners Hospitals for Children – Canada, Mme. 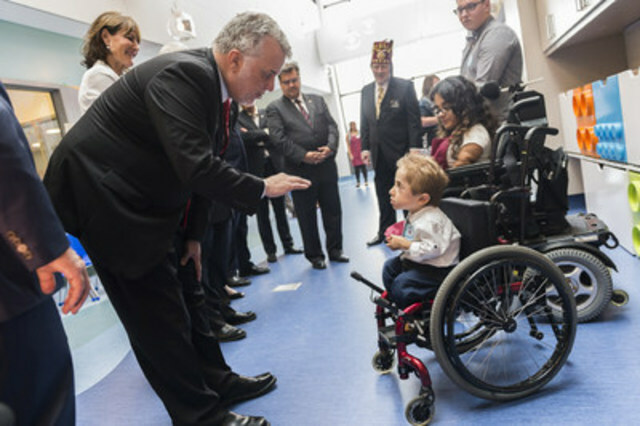 Céline Doray, Administrator of the Shriners Hospitals for Children – Canada, Mr. Gaétan Barrette, Quebec Health and Social Services Minister, Quebec Premier Philippe Couillard and Mr. Jerry Gantt, Imperial Potentate, Shriners International. Image with caption: The Karnak Shriners Patrol Unit leads the way from the ribbon-cutting ceremony to the tent, where the official inaugural ceremony takes place. Image with caption: The Karnak Shriners Patrol Unit leading the way to the inauguration ceremony. Image with caption: Quebec Premier Philippe Couillard during his inauguration ceremony speech. Image with caption: The exterior of the new Shriners Hospitals for Children - Canada, seen from Décarie boulevard. It’s this message: ‘obstacles can be overcome’ that Shriners Hospitals for Children® – Canada wants to highlight in its new partnership as a charity recipient with Spartan Race. The hospital is encouraging adults and children to follow Jeffrey and try the challenge of a Spartan Race. Participants in any race in Eastern Canada this year can choose to raise money for Shriners Hospital for Children® – Canada. The money will go to the Exceptional Care for Exceptional Kids campaign, raising funds for Canada’s new state-of-the-art Shriners Hospital, which will be able to help even more kids like Jeffrey walk, run… or even accomplish a Spartan Race. To get a special Shriners Hospital promo code reducing the Spartan Race registration fee to $60, email cphaneuf@shrinenet.org. Participants will be sent links to start fundraising. Jeffrey tried his first Spartan Race at Mont-Tremblant May 23rd… and finished it. He has since run the Quebec City Sprint and the Ottawa Sprint. He is now preparing for the Toronto Sprint and will be heading back to Ottawa for the more challenging Super Spartan Race in August. Jeffrey was born with a congenital malformation of both the right hand and foot and his limbs did not properly form. He was first seen at Shriners Hospitals for Children® - Canada when he was five months old. He underwent his first surgery at 16 months to correct webbed fingers on his left hand. He continues to be followed at the hospital and each growth spurt is equipped with new prosthetics. 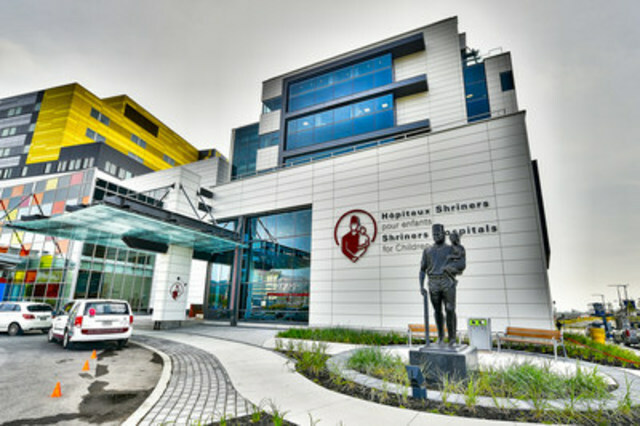 Located in Montreal since 1925, Shriners Hospitals for Children® –Canada is a bilingual, short term, acute care centre providing pediatric orthopaedic ultraspecialized care for complex disorders such as osteogenesis imperfecta (brittle bone disease), severe spinal and limb anomalies, reconstructive surgery and rehabilitation. Children from Quebec and across Canada, the U.S. and around the world have benefited from the hospital’s ground-breaking research and innovative treatments, both in Montreal and in their own communities. This fall, the hospital will be moving to a brand new $127 million facility at the Glen site. Founded in 2010 by eight sports and fitness enthusiasts including Joe De Sena and Selica-Marie Sévigny, Spartan Race is the first obstacle course of its kind in the world. Spartan Race originated in Quebec, but has gained popularity worldwide: there will be 240 events in over 25 countries on all six continents this year. Already over one million participants around the globe have taken part in a Spartan Race. Spartan Races provide the perfect opportunity to challenge oneself and are based on the values of self-esteem, team spirit and respect. Shriners Hospitals for Children - Canada patient ambssador Jeffrey Beausoleil will be continuing his school tour, speaking to students at Cedarcrest Elementary about the importance of pushing yourself to overcome obstacles. It's a message he holds dear, and this inspiring 16-year-old will be proving it again when he runs a Spartan Race on May 23rd. Spartan Races are all about big obstacles, fitness, adventure and outdoors. Jeffrey's extra challenge is that he'll be doing the Spartan Race with prosthetics on his right hand and foot. Shriners Hospitals for Children – Canada is a charity registered with Spartan Race this year, wanting to get the message out that obstacles can be overcome. When you decide to run one of the Spartan Races in Eastern Canada this year, you can raise money for Canada’s Shriners Hospital. The money will go towards our new state-of-the-art hospital that will allow us to welcome thousands more patients every year from across Canada, the United States and around the world. What’s more, if you agree to fundraise for Shriners Hospitals for Children - Canada by participating, we’ll send you a Special Shriners Hospital Promo Code, reducing your entrance fee significantly to $60 (instead of $90-150, depending on the race). In the lead-up to his Spartan Race, Jeffrey will be speaking to elementary school students at several Montreal schools about what it’s like to have prosthetics, how he is simply differently abled, what’s motivating him to try a Spartan Race and how facing challenges head-on is key to succeeding and getting ahead. It’s this message: ‘obstacles can be overcome’ that Shriners Hospitals for Children® – Canada wants to highlight in its new partnership with Spartan Race. They’re encouraging adults and children to follow Jeffrey and try the challenge of a Spartan Race. Participants in any race in Eastern Canada this year can choose to raise money for Shriners Hospital for Children® – Canada. The money will go to the Exceptional Care for Exceptional Kids campaign, raising funds for Canada’s new state-of-the-art Shriners Hospital being built at the Glen site that will allow them to welcome more patients every year. Jeffrey will speak to elementary school students about overcoming obstacles, despite challenges. He will be available for media interviews afterwards. Media are then invited to watch Jeffrey train for his Spartan Race with Athletic Therapist and Personal Trainer Danny Di Michele, President and Founder of PROstudio in Montreal-West. Founded in 2010 by eight sports and fitness enthusiasts including Joe De Sena and Selica-Marie Sevigny, Spartan Race is the first obstacle course of its kind in the world. Spartan Race originated in Quebec, but has gained popularity worldwide: there will be 240 events in over 25 countries on all six continents this year. Already over one million participants around the globe have taken part in a Spartan Race. Spartan Races provide the perfect opportunity to challenge oneself and are based on the values of self-esteem, team spirit and respect. Spartan Races are all about big obstacles, fitness, adventure and outdoors – no matter what your fitness level. And we at Shriners Hospitals for Children – Canada are here to confirm that nearly anyone can do them. 16-year-old patient Jeffrey Beausoleil will be running a Spartan Race - with mud, water and obstacles - with prosthetics on both his right foot and hand. This inspiring young man proves that you can do anything you set your mind to! ARE YOU CREATIVE? HAVE AN AMAZING COMIC BOOK IDE A? SUBMIT YOUR STORY TODAY! Tell us your idea for a story about how to prevent or stop bullying (no drawings needed, Marvel will do that part for us!). The solution must be peaceful and respectful, no “bully the bullies” stories please. If your story is chosen, it will be made into a new Marvel comic book, with YOU as a main character, to be released at the Royal Winter Fair in Toronto in November 2015! Submission deadline is Wednesday, April 15, 2015. Click here to learn more and to select your t-shirt! A 2014 Fiat 500 Pop-S edition raffle to benefit Shriners Hospitals for Children- Canada! The Exceptional Care Odyssey reaches end of the road Our 65-day voyage was momentous, memorable and moving! 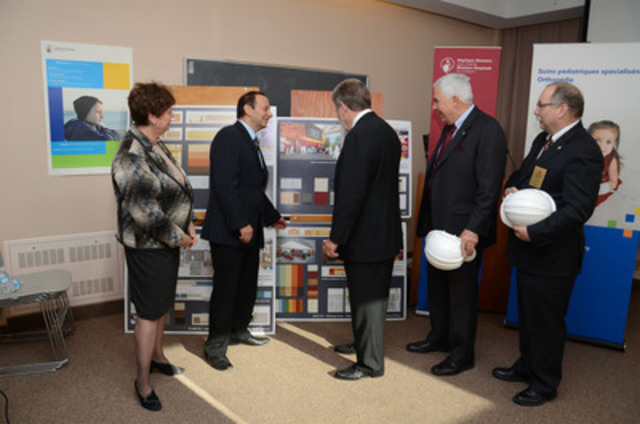 MONTREAL, Nov. 14, 2012 /CNW Telbec/ - This morning, Shriners Hospitals for Children® announced the next steps in the construction of the new Shriners Hospitals for Children® - Canada in Montreal. Hospital leadership reported that the building planning process is now complete, including final plans, interior and exterior design and the engineering schematics. In the next few days the hospital will launch an open call for tender. "We intend to award the contracts in January 2013 and have targeted to begin the excavation process and foundation work in the spring of 2013. The ultimate goal is to commission the building, as planned, at the same time as the McGill University Health Centre in 2015." said Jerry Gantt, who is the member of the Shriners International Board responsible for overseeing the Canadian construction project. "We will begin to build in the spring of 2013 and move in by fall 2015. Our project is on schedule and on track", affirmed Douglas Maxwell, Chairman and CEO of Shriners Hospitals for Children. Mr. Jerry Gantt shared the timeline of the tender: "The bidding documents will be issued today to pre-qualified invited bidders. All the sealed bids will be deposited at the public depository. We will open and tabulate the bids onDecember 14th. We will qualify the bids by mid-January 2013 and award the contracts." At this time, SNC Lavalin has been given the mandate to manage the tender process for Shriners Hospitals for Children. Mr. Gantt further shared that building costs are expected to be within the established budget of $127 000 000 and which has been validated multiple times during the planning process. The new 207 000 square foot hospital, designed by André Ibghy Architects, will feature 8 floors, 2 below ground and 6 above. Administrator Céline Doray revealed the extraordinary interior design of the new hospital. From the Pacific to the Atlantic, each floor will feature the colours and attractions of a different region of Canada. These concepts have not only been incorporated into the decor of the floors, but have also been cleverly integrated into the design of the various service, treatment and waiting areas. The building's interior design is also bright and airy, with a generous amount of large windows and several skylights inviting natural light deep into the heart of the structure. Altogether, this creates a unique healing and caring environment. Our patients and families will benefit from 22 single patient rooms, meeting all the highest standards for infection control. We have planned for several areas dedicated to families. There will be 4 operating rooms, which is double from our current facility. The new hospital will also include state of the art technology for teaching as well as expanded space dedicated to basic and clinical research. "Our hospital is a home away from home for the children and families we serve. They come to us from all over the entire country as well as the north-east U.S.A. The new facilities will allow us to continue to give exceptional care, while at the same time expanding our services, research and teaching" concluded Paul E. Frank, Chairman of the Board of Governors, Shriners Hospitals for Children - Canada. Shriners Hospitals for Children®- Canada has delivered pioneering, patient centered, compassionate care to patients and their families from Canada, the United States and beyond in a healing environment since 1925. Based inMontreal, it is a bilingual institution providing pediatric orthopaedic treatment for patients with highly complex conditions, including scoliosis, spina bifida and other spinal malformations, osteogenesis imperfecta (brittle bone disease), metabolic bone disease, skeletal growth abnormalities and congenital anomalies of the musculoskeletal system. Every member of our staff, from surgeons to therapists, nurses to educators, is committed to helping children reach their full potential. Shriners Hospitals for Children - Canada may be small, but its reach is great. Children from across Canada, the U.S. and around the world have benefited from the hospital's ground-breaking research and innovative treatments, both inMontreal and in their own communities. Above and beyond world-class care, they have found a home away from home, a place where their disability does not define who they are, but is merely a stepping stone to becoming the most productive, active and autonomous adults possible. 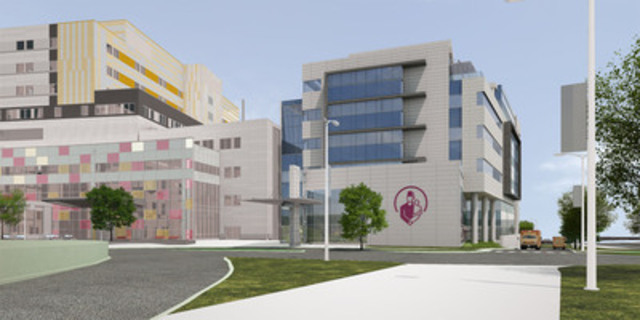 This morning, Shriners Hospitals for Children announced the next steps in the construction of the new Shriners Hospitals for Children - Canada in Montreal. Hospital leadership reported that the building planning process is now complete, including final plans, interior and exterior design and the engineering schematics. In the next few days the hospital will launch an open call for tender. "We intend to award the contracts in January 2013 and have targeted to begin the excavation process and foundation work in the spring of 2013. The ultimate goal is to commission the building, as planned, at the same time as the McGill University Health Centre in 2015." said Jerry Gantt, who is the member of the Shriners International Board responsible for overseeing the Canadian construction project.